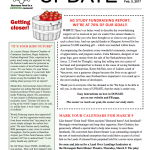 A lively edition of UPDATE Newsletter for you to enjoy. In this edition, we recap the ‘Bring It Home’ Harvest Festival, announce the release of the North Pickering Farms vision maps, and give you a sense of our calendar in the months ahead. Read more here! The goal is within sight for our Ag Study Campaign. 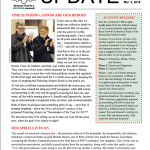 Read more in our most recent issue of UPDATE Newsletter! This issue also includes a wrap-up from our recent AGM, a request to complete the Government of Canada’s National Food Policy Survey, and an urgent requirement for all our supporters to ensure they have “consented” to receiving emails from Land Over Landings. If you’re not on our supporter list yet? Click HERE and add your name to the growing list of voices advocating for #FoodOverFlights on the Pickering Federal Lands.